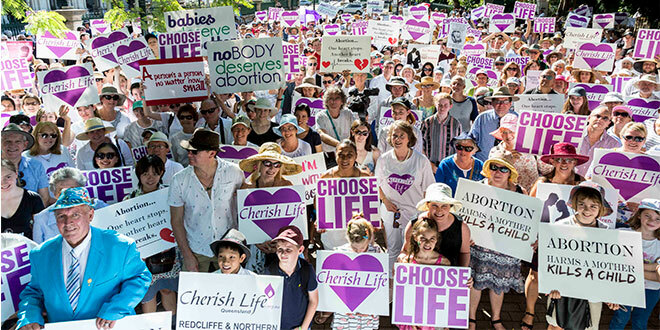 Life matters: A large crowd of pro-life Queenslanders gather outside Parliament House for the March for Life rally in Brisbane. Photo: Alan Edgecomb. NATIONALS MP George Christensen will urge the Federal Treasurer to divert millions of dollars in foreign aid that supported an international abortion agency last year to fund local organisations helping women in unplanned or crisis pregnancies. 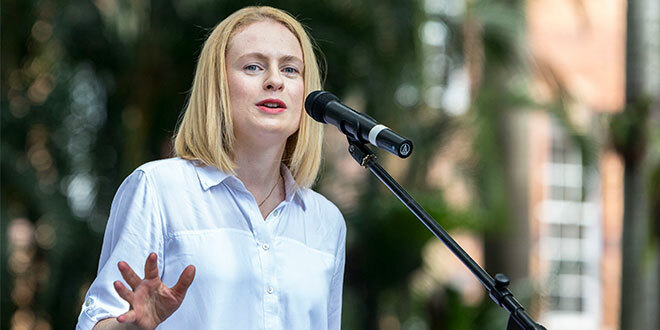 The Queensland politician joined numerous politicians at the annual March for Life rally outside state parliament in Brisbane on Sunday March 18. He told the crowd of an estimated 2000 people he was ashamed to learn that the Federal Coalition Government gave $9.5 million in foreign aid to the International Planned Parenthood Federation to fund abortion in third world countries. Foreign Affairs Minister Julie Bishop endorsed the move after United States President Donald Trump banned foreign aid for overseas abortion providers. “I’ve got to say that was a disgraceful act, a very low point I think for our nation, that we have poured that money into the procurement and promotion of abortion to people who are poor, vulnerable in developing countries right around the world, “ Mr Christensen said. Mr Christensen promised to write a letter to Treasurer Scott Morrison to urge him to divert the funds to support pregnancy, crisis and counselling services for young Australian mothers. 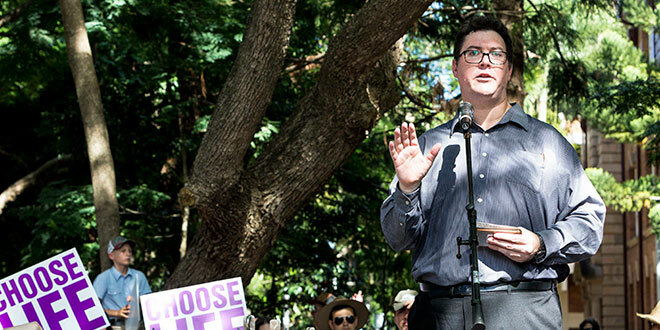 Mr Christensen asked pro-life supporters to speak out against changes to Queensland’s abortion laws, which will be addressed once parliament receives recommendations from the Queensland Law Reform Commission. “I’m here because of one thing that I fundamentally believe, and that is that life matters,” he said. Support politician: Nationals MP George Christensen addressing the crowd at the March for LIfe. Photo: Alan Edgecomb. The day before the march, Mr Christensen attended a national summit on abortion law reform held in Brisbane that discussed ways to inform legislators on how to care for women in unplanned or crisis pregnancies. During the summit Mr Christensen met Cherish Life president Julie Borger, who invited the politician to speak at their rally in Brisbane city the next day. Mrs Borger said she showed Mr Christensen her notes from the summit’s morning sessions, which included talks on counselling post-abortive women, the legal context of abortion in Australia, testimonies from women who had unplanned pregnancies including two who were forced to have an abortion, and the perspectives of gynaecologists and obstetricians affected by abortion laws. The pro-life Catholic woman said she was encouraged by Mr Christensen’s willingness to support genuine care for women. Mrs Borger said Cherish Life called on all members of the public who were against changes to Queensland’s abortion laws to speak with their parliamentarians. “We’re now wanting our members and people in the public community to know that we need to again be letting our parliamentarians know that we do not want abortion laws to change,” she said. 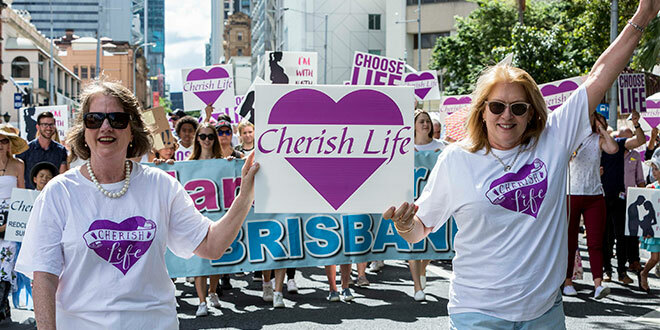 Encouraging rally: Cherish Life Queensland president Julie Borger (left) leads the crowd of 2000 pro-life Queenslanders through the streets of Brisbane. Photo: Alan Edgecomb. Incoming Liberal National senator for Queensland Amanda Stoker, a former Brisbane-based lawyer, said even though children and babies were unable to vote “we must ensure they are heard by and protected by those who govern”. “We know the measure of a society is how it treats those who cannot speak for themselves – now that includes some people who are disabled or ill, it includes the aged, it includes children, but it must also include the unborn,” Ms Stoker said. She cited the International Covenant on Civil and Political Rights which states that “every human being has the inherent right to life” and was afforded legal protection. “So attempts in this context to suggest that a foetus is something less than a human being are mere justification, flying in the face of the scientific investment and progress that has been made to ensure the viability of prematurely born babies,” she said. Ms Stoker encouraged lawmakers in Queensland to focus on policies that supported women who wanted to raise their child or improve adoption laws to help families who could not have children. Support babies: Incoming Queensland Senator Amanda Stoker speaking at the March for Life. Photo: Alan Edgecomb. State Member for Oodegeroo Mark Robinson was given a letter to present to Queensland parliamentarians on behalf of Cherish Life Queensland, the Australian Family Association, the Australian Christian Lobby and March for Life rally supporters. The letter explains that an independent review of the 2725 submissions to the Health Committee reviewing two abortion bills submitted by former independent member Rob Pyne found 84 per cent of submissions were against the proposed bills. Dr Robinson said the Pyne bills were rejected because Queenslanders were against bad abortion laws. “It is a privilege to be with you because you are this crowd of the resistance – and, in Star Wars manner, we absolutely need the resistance,” he said. “We won against the Pyne bills because of the resistance, because people like you and thousands and tens of thousands of others stood and fought against it and resisted bad legislation. Dr Robinson promised he would not vote on any abortion reform bills presented in parliament this year. This story appears on the front cover of the March 25 edition of The Catholic Leader.